Altitude of Nganglhakhang – 9500ft. The route follows the Chamkharchu, a river rich in trout. Stop for lunch at Thangbi Lhakhang. From here the trek enters the Ngang Yul (Land of the Swan) at the center of which lies the Nganglhakhang (Swan Temple). This place was filled with swans in ancient times, hence the name. 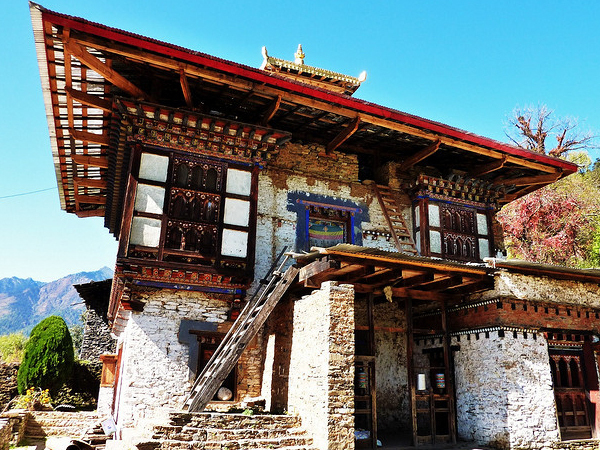 Nganglhakhang is located at distance of 18 kms from Bumthang. The best time to visit Bhutan is March, April, May, and September & October since this period provides clear blue sky, and plenty of greenery. Winter (Dec, January, February) will be too cold since the temperature will be below zero degree. Summer (June, July, August) is pleasant but wet due to the monsoon. Autumn (September, October, November) is similar to spring but a bit warmer and also the best time to visit. However please see the tours and treks sections for specific time to visit the specific areas.